Low cost electrochemical or infrared (IR) approaches lack the sensitivity to identify emissions except in close proximity. Conversely, high resolution monitoring equipment and IR cameras that can image methane emissions are expensive. Also, high-resolution instruments are often bulky, use high power, need regular maintenance, and are not user-friendly. Since methane emissions are often intermittent, reducing the cost, size, weight, and power will allow for constant monitoring, enabling the detection and repair of leaks sooner. Rebellion Photonics’ existing product, a large spectral imaging camera called the gas cloud imager (GCI, see Figure 1), uses snapshot spectral imaging, which is well suited to size and cost reduction. Snapshot imaging can also leverage uncooled detectors, which have dropped in price from ~$5,000 to $200 due to Defense Advanced Research Projects Agency (DARPA) research. Leveraging these developments into a deployable product has not been done before and requires cross-disciplinary collaboration. Figure 1: Under this project, Rebellion has miniaturized their gas cloud imager – the GCI (right). The mini-GCI (middle) is a mid-project functional prototype for which the team has already taken orders. The team will be shortly testing an even smaller goGCI (left) which will be 4.25in x 3.25in x 2.60in, 1 lb., battery powered, and will include embedded gas detection analytics. Rebellion Photonics began by reducing the form factor of the GCI to the size of a soda can. The smaller unit can be mounted on a worker’s personal protective equipment (PPE) (Figure 2). 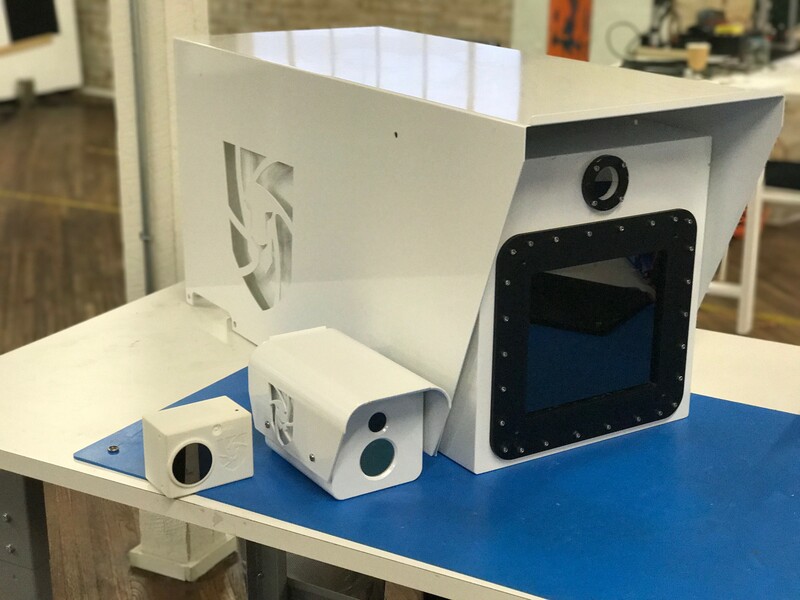 As of 2017, the team has reduced the camera’s optics size to support this goal and is selling that as part of a mini-GCI unit, which is the size of a shoebox, allowing for easy deployment through parcel shipment. Rebellion Photonics also developed the analytics to calculate flow rates from the obtained images, and developed an approach that works for high and low flow rates, as well as when part of the gas cloud is obscured. The team had to then address several challenges related to the ability of a small, battery-operated camera to communicate remotely. Spectral imaging cameras obtain massive amounts of data in a short timeframe. This requires significant data compression or on-board analytics to send data via satellite, which affects battery life. This makes spectral imaging cameras difficult to operate autonomously with batteries. Rebellion is porting the flow rate algorithms and detection algorithms to field programmable gate arrays (FPGAs) that can handle the processing onboard with less power. The minimum required data is sent via 4G to a remote control center to communicate an alarm, and if control center staff need to investigate further, a complete image can be sent. The team’s progress is paving the way for an industrial goGCI, a wearable, continuous-monitoring IR camera. Rebellion Photonics is already selling the intermediate result from the ARPA-E project, the mini-GCI, for a variety of applications. The mini-GCI’s are deployed in fixed-use installations to provide methane and volatile organic compounds detection and safety monitoring. A key feature of the mini-GCI is its ability to quantify flow rate, which provides a competitive advantage for prioritizing which issues to fix first. Rebellion Photonics has conducted more than 12 product demonstrations with potential customers, including many large oil and gas firms. Customers have ordered 15 mini-GCIs to date. 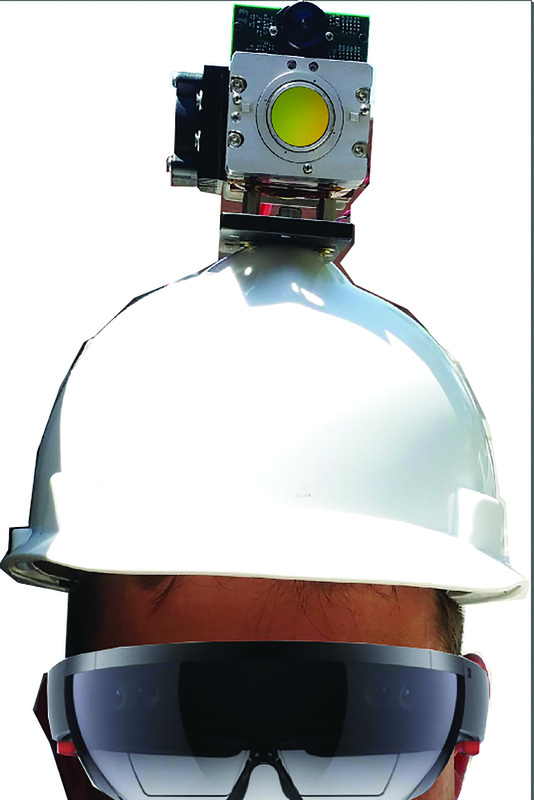 As the goGCI is developed, Rebellion Photonics will expand its offering, including both a PPE-mounted goGCI and a small, fixed-mounted camera that can be installed at a variety of wellheads, compressor stations, and offshore rigs. Rebellion Photonics has developed a cloud-based user interface that support staff at control centers. If successful, this technology could help reduce methane emissions across the natural gas supply chain, helping to reduce costs, improve efficiency, and enhance workplace safety. The wearable technology could also help gas producers minimize the time and costs associated with sending crews to individual sites and therefore allow for quicker identification of unintentional emissions. If the wearable technology is successful, current estimates indicate the cost per year for monitoring methane at a well site could be reduced by more than an order of magnitude. As of January 2018, the Rebellion Photonics project has generated two invention disclosures to ARPA-E. One U.S. Patent and Trademark Office (PTO) non-provisional patent application has been filed on the disclosed inventions.